After the pronouncement, every one cried “Ta-da” at the bride’s request. Photo by Amy Bahe. Editor’s note: I wrote recently about a night of blessing for Duane Buehrer, and I’ve written several times about Abby Hagger, a college student who has been living with us for the last 2 and a half years. This last weekend I officiated at their wedding. Here is the homily. It’s not often that a man has the privilege to officiate in the wedding of two people he knows so well and loves so much. We’ve known you, Duane, since you were still crawling on the floor. And we have watched you grown in wisdom and stature and the knowledge of God. And Abby, you came to us in the spirit of a daughter. You gave us the freedom to correct you, the opportunity to care for you and a joy to love you. Many daughters in the flesh have not been so gracious and so wise. So know this. I speak as a father in the faith. It is good that you learned to have wait on the Lord, because He has given you a man more thoughtful and more generous than you yet know. It is good to be chosen by such a man. And Duane, this is a woman with a gentle and sensitive spirit. Once you get past the fact that she talks to her plants, you will find she is herself transparent and tender, easily bruised but resilient and trusting. Treat her as the fragile treasure that she is. It’s been our joy for Katie and I to join you in the journey to this altar. You have been careful and thoughtful and we are confident that you will flourish. And so the two of you have come here today to make a covenant. 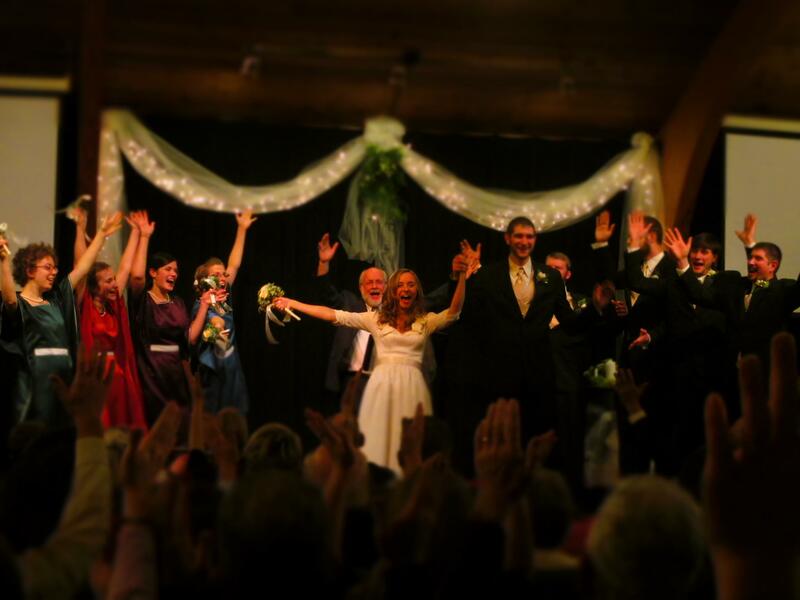 A Christian wedding bears many of the marks of ancient covenant making. You have witnesses here. We will eat together. There will be a symbol exchanged and a name changed. Vows will be made, and two will become one by purpose and by pledge. We live in a world where marriage is seen mostly as a promise to be made, but broken if it becomes inconvenient or unsatisfying. You have not come here today to make such a promise. You have come here to make a covenant. A covenant is not a contract. We make contracts to protect ourselves. We make covenants to give ourselves away. A contract is about your liabilities. A covenant is about your responsibilities to each other. The prophet Malachi tells the people of Judah they will be destroyed because they have broken the covenant their fathers had made with God but also because of the covenants they had broken with their own wives. We break the marriage covenant with great peril to our own souls, the danger of covering ourselves with violence. No one here today who has been divorced is happy that it turned out that way. Divorce does damage to our soul. Always. The covenant you make is sacred and permanent. It is approached with reverence and sealed with blood. There is no backing out or giving up. You will swear before these witnesses to cherish each other until our Lord comes or until death alone shall part you. I know you know this. And I know you want everyone here to know it too. This is a binding oath you make, and your willingness to accept it reflects your understanding of God’s own covenant keeping love for his people. This is not a mystery because we are unable to understand it, but because we could not have expected it. In our brokenness, we come together as one flesh to extend grace to each other, to support and encourage each other, to love and cherish our wives, to honor and obey our husbands. When we do this the world knows something about how Christ loved the church and gave himself for it and about how the church responds with humillity and faith. This is your calling now, to love each other in such a way that your neighbors and your children get a glimpse of how God loves to His people. It is a high and holy vocation, one by which we ourselves are sanctified. You will learn more about grace and patience and forgiveness in the next three months than you have in your entire life so far. You will be like Adam and Eve, both naked and ashamed. In your life together you will find weaknesses you never imagined and failures you cannot overcome. This is good, because in your need you will become heirs together of God’s grace. You will need Christ in more ways. You will seek him with more intensity. This transformation may take years. But in a few moments it begins. You will promise to stay at it for better, for worse, for richer, for poorer, in sickness and in health, until death itself shall separate you. Duane, if you accept the responsibility of laying down your life for Abby as Christ does for his church, and Abby, if you respect this man and God’s protection through him, then this covenant will endure for your good and for God’s glory. By His grace alone you will both keep this covenant and be transformed into the image of His Son. By His grace alone the world will watch and wonder at the power of covenant keeping, sanctifying love. Excellent clear description of the contract/covenant contrast! I’m adding this to my collection of “thought-provoking sound-bytes” for discipleship opportunities. You’ve given Abby and Duane the perfect words on which to begin their life together. I wish them both all the joy that is evident in the photo and years of delight and contentment. A beautiful homily, Wally. Wish I could have heard it. Thank you Wally. Why the Lord saw fit to bless me with the joy of getting to know you and Katie I still do not understand, but I am forever grateful. Thank you for all your love and direction.